I used to compulsively buy things. Nothing would fill me with more temporary joy than finding some cool new shiny object for a minuscule price. I’d always had the luxury of space, and for most of my life, the luxury of disposable income, so I own many things and some of them are valuable, but most of them I can honestly live without. I keep an emotional tie to them mainly because I don’t really want to see everything I own be donated or scrapped. I’m in the old place now, writing, because it has Internet access and my laptops are still here. I still have quite a few sentimental items here. I should probably move them over in the next day or two to secure them in the new place. It’s just one of those feelings where I want to get the biggest items by volume, rather than prioritizing things like sentimental pictures. Notice how deeply I was thinking there. 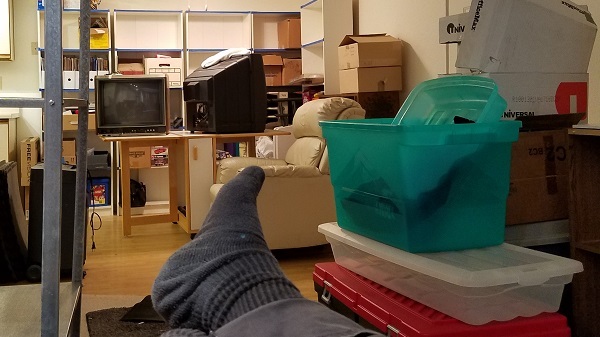 I almost have to think my way out of all this clutter because otherwise I’ll be stuck in larger apartments or rental houses or storage units for the rest of my life. How many of these things do I really want to keep? Could I eventually put everything up for sale or storage then living in a suitcase? I bought as much as I did because it felt like a physical anchor to reality, in the sense that the more I owned, the more obligations I had, but now I see that I am significantly happier interacting with others or writing than I am engaging with most material objects. My VHS tapes are fun, but it’s not the same as hanging out with friends. If anything, this move has taught me the value of friendship. I’ve felt isolated in this old place as I pack away everything. When I was at the new place earlier today, I felt a burden lifted from me, because I wasn’t looking around for stuff to bring with me. Instead, my focus was on how great it was to find a place that fit my needs and wants. It’s not perfect, but to downsize in a casual manner in which I can actually return to talking to and hanging out with friends, it will work just fine. I imagine once I say goodbye forever to my old place, like I did the old apartment, then I’ll feel relief from this burden of moving. I imagine the downsizing will go quick. I’ve wasted months now undoing my hoarded emotional baggage. Inspirations: J.D., the editor of Moving Zeal, suggested that I write about the emotional side of downsizing. As I took the day to rearrange the two days of large moves both J.D. and another friend of mine did to help me out, I realized something that was probably lost in the wild rambles: I appreciate my friends and I can’t believe I allowed all this junk to separate me from them. Photo: My new apartment after a few days of moving.